Our Duvet range consists of Home Wash Panel Duvets, Waterproof and Wipe Clean Duvets. 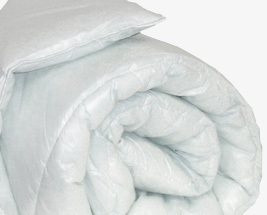 The Wipe Clean Duvets are easy to clean, whereas the Waterproof Duvets repel liquid and can be washed. The unique Home Wash range unzip into panels and can be washed in a domestic machine. The range includes various togs, features and duvet fillings depending on personal preference.